While at the Lake for work on the 16th I got an odd phone call from my youngest sister (my mom and her babysit whenever I'm away) saying that Ringo would not come our from underneath my moms deck. Not unlike him (stubborn was his middle name) and due to the fact it had just began to storm (he hates rain), I didn't find it too peculiar. She attempted to coax him out using his favorite treat, Peanut Butter and by putting me on speakerphone to let me coax him out to no avail. Far enough under he couldn't be grabbed out, my sister was at a loss and began to worry he was stuck (he wasn't). Three hours away I'm panicking - my coworker mentioned that the dog pound would get him I think we are saved. Till we realize everyone is closed. By this point I'm alarmingly alert and ready to go home. Thankfully, Ringo comes out on his own after some time and sets up residence on the top of the deck. But no, he again won't budge. My mom brings him fresh water and tries yet again to coax him indoors - being every bit of 80 lbs they couldn't pick him up. Eventually he comes inside and goes into his crate, but at this point my mom has begun to worry something may be wrong. Enough to solidify my feelings I call my vet, give him the scoop, and he says to bring him in. Mom gears up to take him, and I start the trek home. Along the way I get a phone call from my vet stating Ringo was extremely anemic, on fluids and undergoing blood work because he found some blood in his rear. Unsure of what was going on, he said he'd call me soon with an update, but was certain he needed to stay overnight. Upset he would be staying overnight, I pressed forward on my commute and tried not to hyperventilate. Thankfully my friend called and distracted me and I made it back without getting into an accident or a speeding ticket. The events that followed are a blur. I should have realized when the vet said he'd wait for me to make the three hour drive back he wasn't just being an amazing doctor. Greeted by my mom, youngest sister, two aunts, and my friend (whom I was on the phone with) a pit dropped into my stomach. Once inside the room seeing Ringo wrapped in a blanket it didn't hit me until as I caressed his head, willing him to get better and to let him know I was there - the vet turned my world upside down. After doing an ultrasound he found the source of the bleeding, one of a few tumors in his belly that were bleeding, leading him to believe Ringo had some sort of carcinoma (cancer). Surgery could be done, though it wouldn't necessarily solve everything due to the scope, and due to the fact he also discovered Ringo was in renal failure, his recommendation was to lay him to rest. The floor gave out underneath me. I felt as if someone had just punched me in the gut. This could not be happening. I mean, Ringo was the healthiest dog, only going to the vet once for a cut and another time due to a stomach virus. Plus he was only 9 1/2, in my mind too young to have ailments other than sleeping more and less energy, after all he was fast approaching 10. Given the chance to say goodbye and the ability to hold him in my arms during his last moments were the hardest thing I have ever done, but looking at my precious dog in pain, there was no way I would be anywhere else other than exactly where I was, letting him know he was surrounded by love and no longer had to suffer. I have no words. Sadness, grief, and despair cannot come close to the hole that is left in my heart. I'd had Ringo since he was 8 weeks old, watched him grow, eat my things, develop a personality and love me and my family so unconditionally. He was by far an incredible pet. My best friend, running buddy, constant companion and taste tester. My middle sister Jennifer sent my family the eulogy below. It's a gorgeous remembrance of a family member who touched our hearts deeper and more profoundly than ever imagined. I miss him with each passing moment, and will be forever grateful I had to opportunity to be his owner, share countless memories, and say goodbye. Yesterday evening, Ringo Ginger of Bel-Nor and University City, MO, was laid to rest. Just like his owner, he preferred not to share his age. 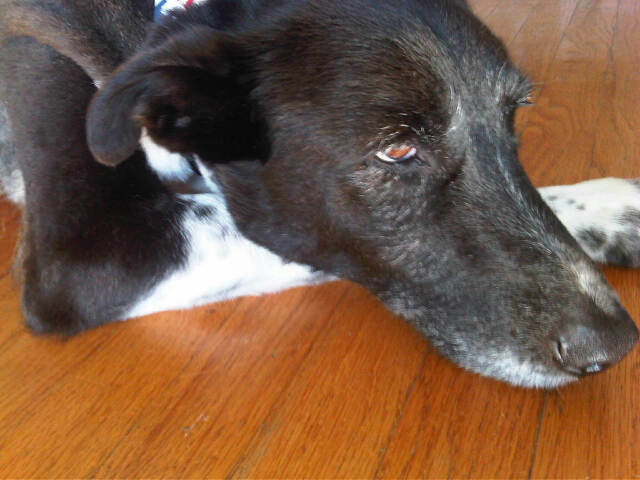 Ringo enjoyed human companionship, long walks, peanut butter, licking toes and sleeping with one eye open. Serious and quirky, Ringo slyly defied conventions and commands. He is survived by his owner, Marcia Ginger, and a host of caretakers. He will surely be missed. there are no words to fully express the profound sorrow over the loss of a beloved family pet. I've gone through this Marcia, I feel your pain and I am so very sorry. my deepest sympathy. Shan, I truly appreciate your kind words, and grateful for our TAM-inspired friendship. Hope all is well with you.